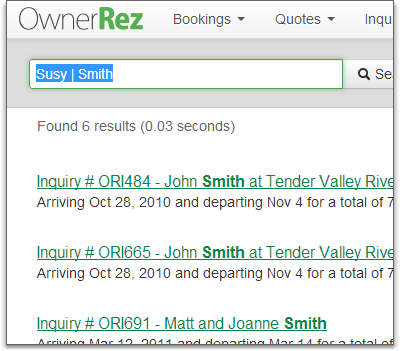 You can now search your inquiry, quote and booking records via full text search. Think of it as a miniature version of Google inside OwnerRez. Need to pull up Susie Jones's booking? Click search and type "susie" or "jones" and it'll pop right up. As you'll see, the search interface offers a simple "one box" layout where you enter some variation of text and the results are ordered by relevance. The results page uses a standard search engine look and feel with payments and security deposit records nested under the appropriate booking. If your search only matches a payment or security deposit record, the parent booking comes along for the ride. 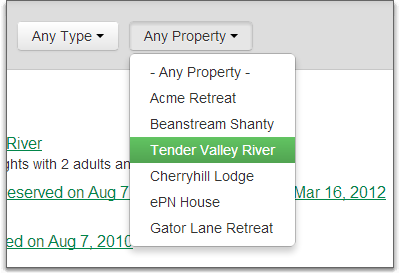 On the results page, you'll notice two additional filters for record type and property. These filters will help our larger users dig through their search results a little faster. The search technology we're using is very powerful, flexible and fast. We've tested it with dozens of thousands of records and many hundreds of search terms. You shouldn't see any problems with speed or functionality, but if you do please let us know.